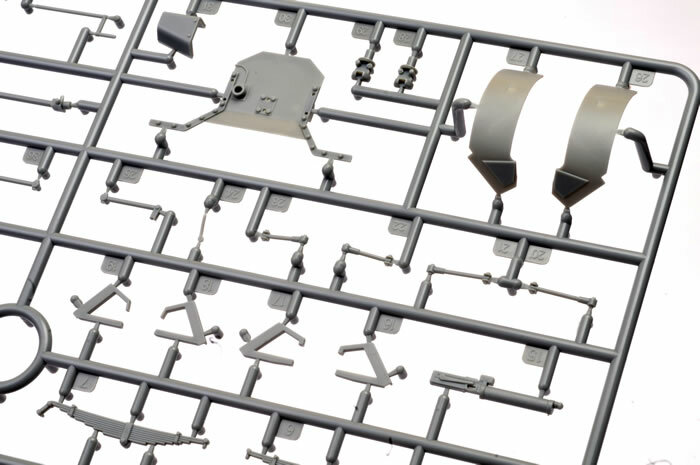 138 parts in grey plastic; decals for five marking options; full colour 18 page instruction booklet. 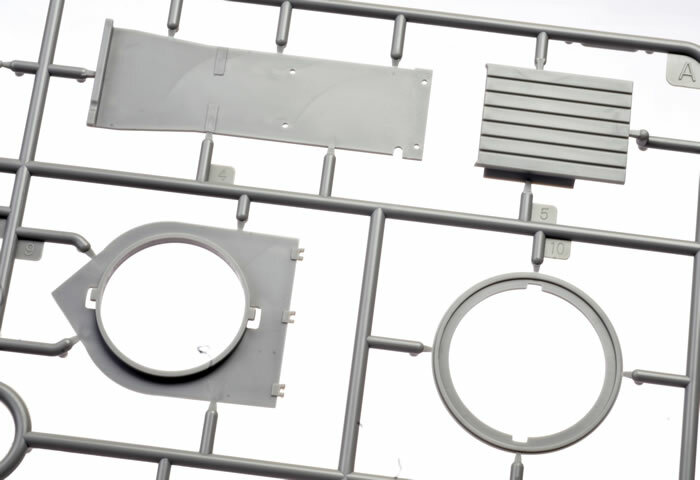 Advantages: High level of detail; excellent moulding quality; impressive surface textures including raised rivets and recessed panel lines; thinly moulded integrated plastic wheel spokes; well illustrated and logically laid out instruction booklet. This is the newest incarnation of Copper State Models' fourth WWI kit and their first military vehicle. 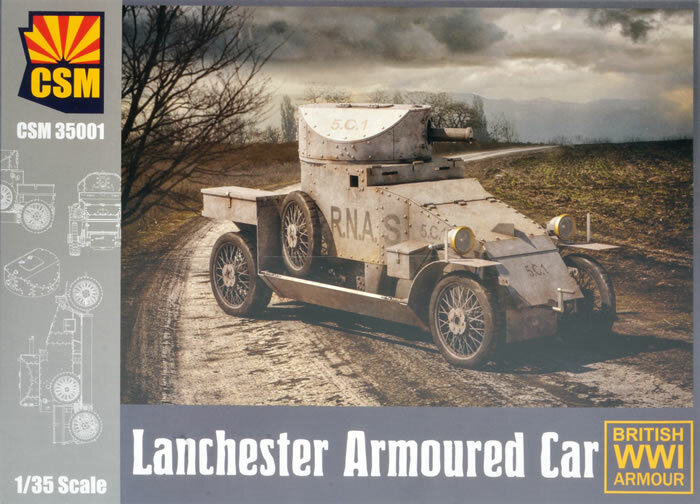 CSM's 1/35 scale Lanchester Armoured Car maintains the high plastic standard, quality presentation and luxurious packaging of its WWI aircraft predecessors. I'll be building this one next! 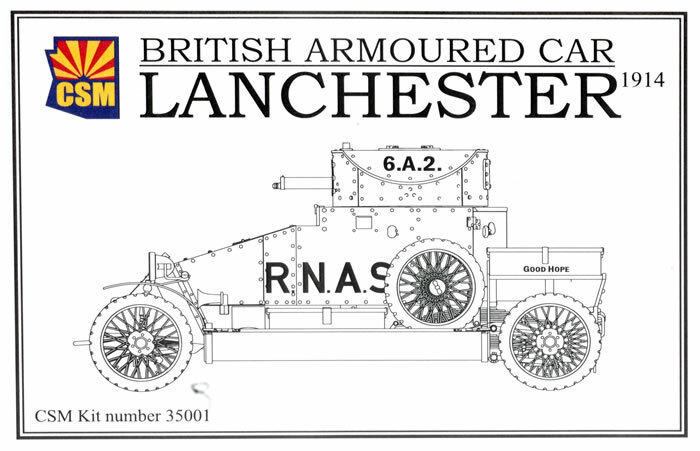 The Lanchester Armoured Car was a British armoured car derived from the Lanchester Sporting Forty touring car produced during the First World War. It should not be confused with the later interwar period six-wheeled development. 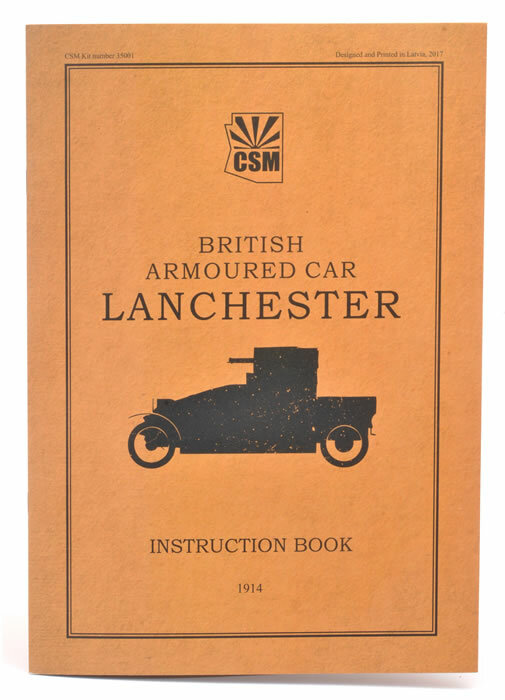 In 1914, the Lanchester was the second most numerous armoured car in service after the Rolls-Royce. Designed by the Admiralty Air Department for the Royal Naval Air Service Armoured Car Section in France it was intended to support air bases and retrieve downed pilots. A prototype was produced in December 1914 with production following in early 1915. A number of changes were made; principally strengthening the chassis and suspension, and doubled rear wheels fitted to the rear axle to improve traction, weight distribution. The vehicle had a distinctive circular turret with a narrow horizontal roof with central hatch, steeply sloped at the sides, and continuous sloped bonnet plating. This last, together with a much more compact form than the earlier Rolls Royce Armoured Car achieved by positioning the driver beside the powerful and reliable engine, which featured an epicyclic gearbox) gives the Lancaster a deceptively modern appearance that matches its paper specification when compared with its later inter-war 6x4 version. Thirty six of the production version were sent to France in May 1915, one twelve-car RNAS squadron served with the Belgian Army. In addition, Belgium received between 10 and 15 cars on loan from the RNAS. On the Western Front it served its intended purpose despite what were considered advanced features. However, with the rough road conditions and even rougher cross-country treks the 4x2 Lanchester chassis caused difficulties which were never satisfactorily resolved, limiting its usefulness. Copper State Models was originally an American cottage industry manufacturer of WWI aircraft kits and accessories. 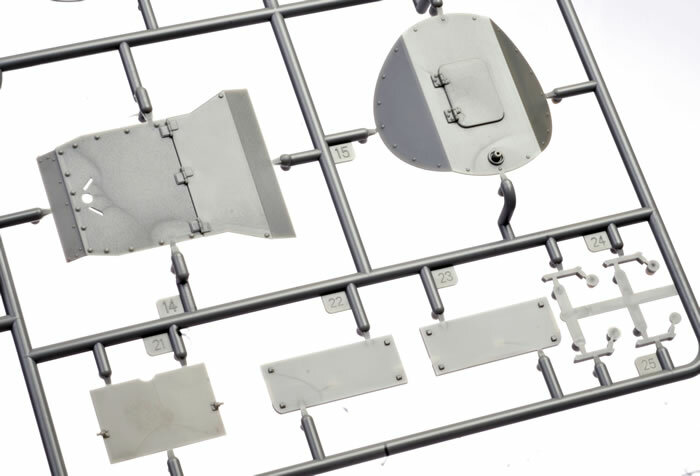 Its models were generally a multimedia mix of resin and white metal parts. A change of ownership in 2012 has led to a change in direction. 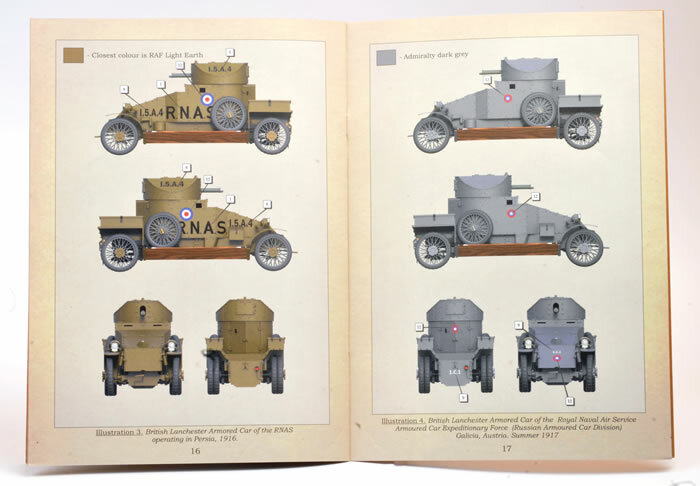 Still focused on WWI subjects, the company is now revisiting the Copper State Models back catalogue and restoring the kits. They are also launching a series of all-new injection moulded plastic models, including 1/35 scale military vehicles and figures. "We are group of WWI scale modelling enthusiasts from two continents and six countries united by common interests and hobby. 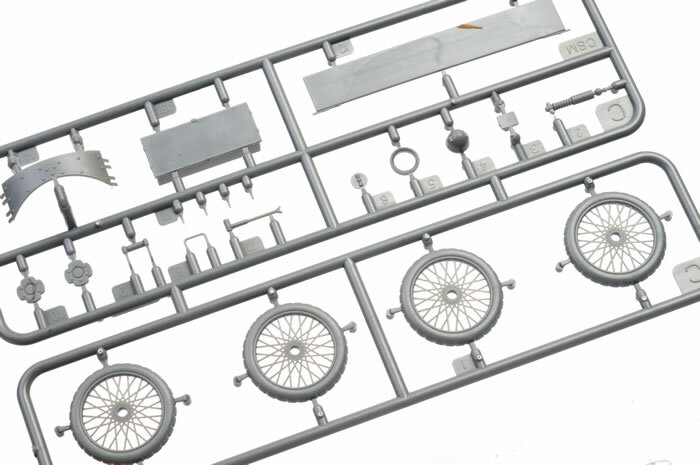 We produce the finest quality World War One aeroplane multimedia resin kits in 1:48 and aftermarket accessories in 1:72, 1:48, 1:32, and 1:28 scales. 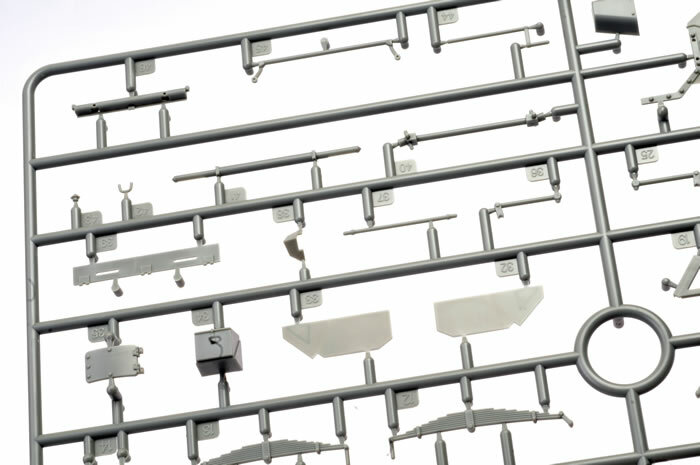 Our high-quality 1:48 scale multimedia kits contain resin, and NiAg Photo-Etch (PE) parts, and include decals for the appropriate colour schemes. Some of the kits include WM parts. When documentation exists for interior details they will be provided for you, but please note that some minor parts may need to be made from scratch (such as tailskids, control sticks etc.). Most of our kits will be the first time these aircraft have been produced in 1:48 scale. Since we took over the CSM from the founder Mr Eric R. Hight of Phoenix, Arizona who is still an inspiration to us, we have sent all master kits for the restoration. Unfortunately two 1/48 master kits were run down completely and to be re-built from the scratch. Please note that all of us at CSM have daytime jobs and families. The Copper State Models SIA. as company registered in Latvia (EU)." 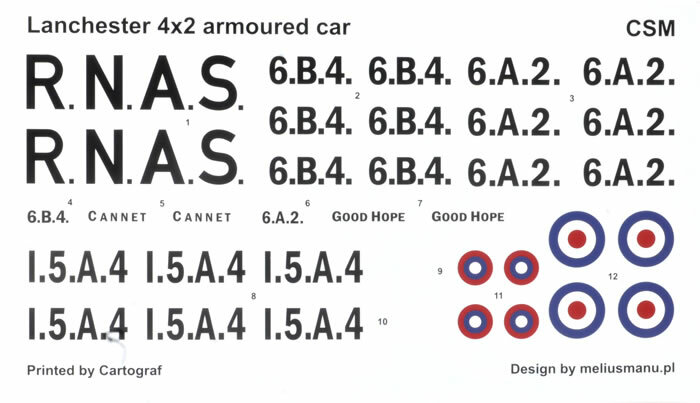 Copper State Models' 1/35 scale Lanchester Armoured Car comprises 138 parts in grey plastic, decals for five marking options and a full colour 18 page instruction booklet. The model is packed under an attractive cover and inside a stout cardboard box. 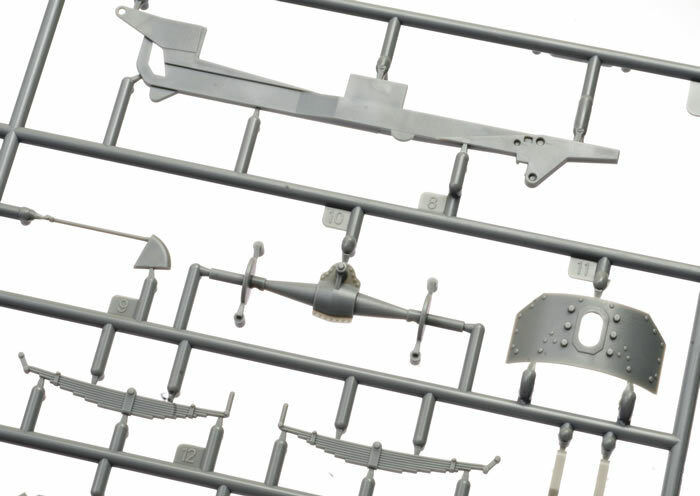 In common with the previous WWI aircraft releases, moulding quality is world class and sprue attachment points are narrow. 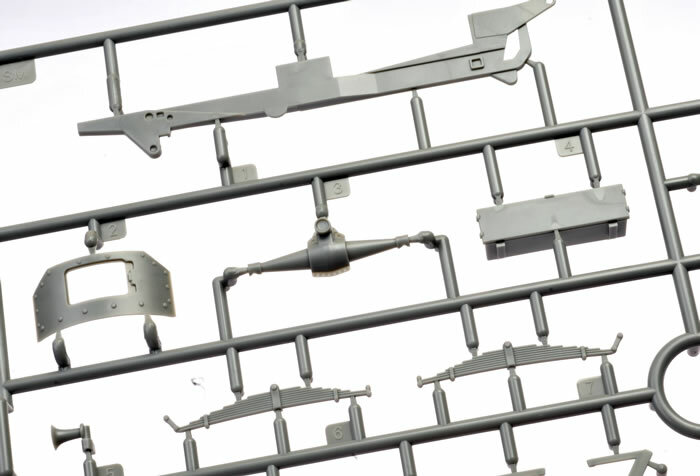 Surface textures look fantastic too, with a very effective combination of raised rivets; hatches, hinges and access points in relief and recessed panel lines. The hull and turret are made up from separate panels - sides, front, rear and several upper panels for the hull, and four side pieces and a roof for the turret. You'll want to test fit and carefully align these important elements before committing to glue. The running gear is quite well detailed. 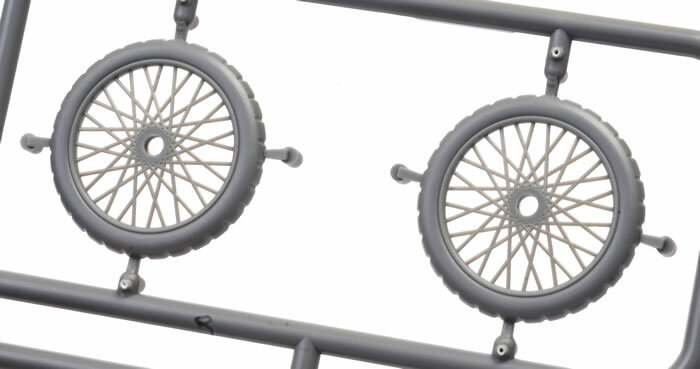 The front axle assembly appears to be designed for the front wheels to be posed straight ahead, although the separate axle ends might be modified to permit the wheels to be offset. The top turret hatch is moulded shut, but the side hatch is a separate part. There is no interior though, so most will glue it shut. 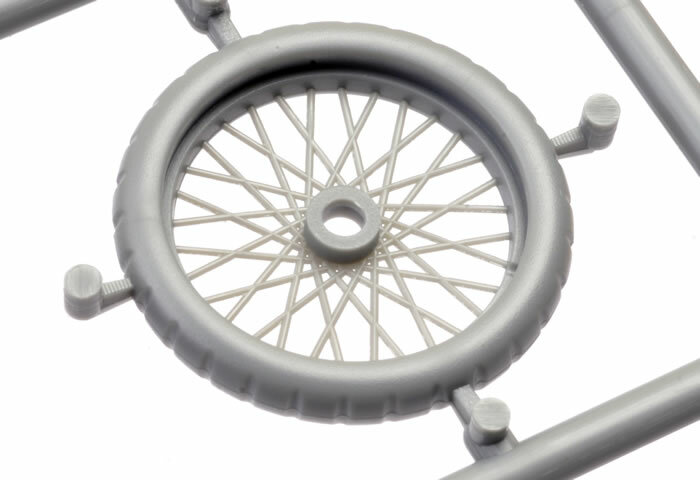 The wheels are cleverly moulded plastic parts with fine spokes moulded as one with the tyre on one side, and a separate set of spokes for the opposite side. 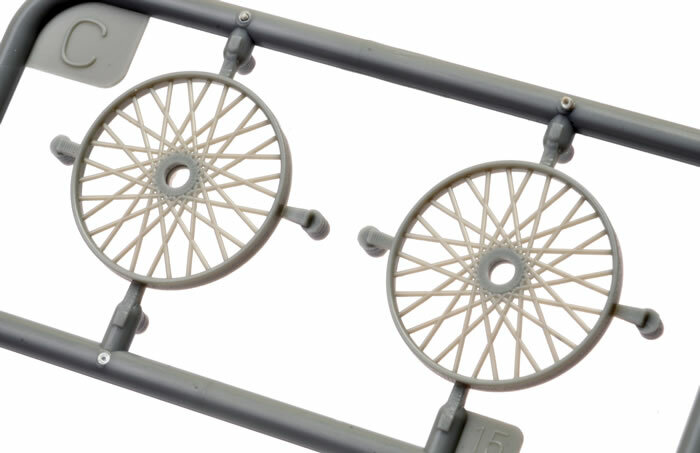 This should look very effective when assembled and painted. three of these are R.N.A.S. vehicles, two in Admiralty Grey and one in RAF Light Earth. one Belgian machine in a colourful scheme of Grass Green, Ocher Clear and Dark Red Ochre with dark outlines to the patter. Decals are well printed and in register. 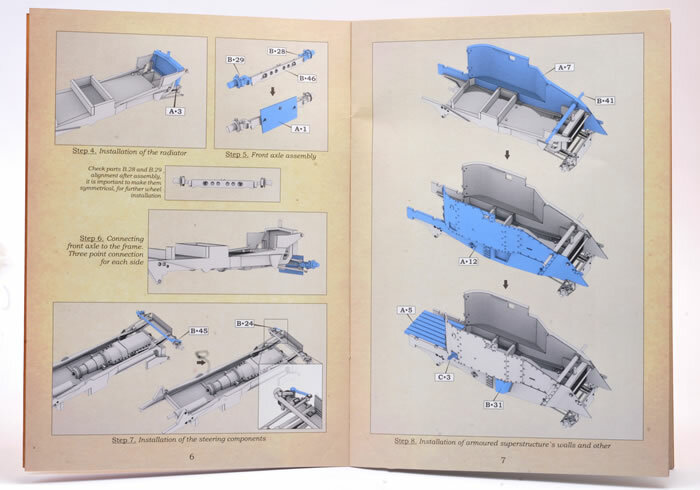 The instructions are presented using clear, concise colour keyed illustrations broken down into steps of assembly and painting in the form of an 18 page booklet. Colour callouts are made throughout. Thanks to Copper State Models for the sample. Historical information courtesy of Wikipedia.